My friend John departed from Larissa city driving my Ford Fiesta loaded with all the equipment for our trip. It was still morning when he arrived in Xanthi where we meet. At 11:40 we started from Xanthi the long trip to Turkey. In less than two and a half hours we crossed the border, without any significant delay. The road entering to Turkey is under reconstruction, but after a while it is very good. At a gas station we stopped to exchange currency and drove without to stop, in order to go as further as possible to east, in the first day. We pass outside of Raedestos city (Tekirdag) at 15:20 and we continue the road to Istanbul. The road was very good and had automatic toll. Unfortunately, we did not know the tolls works, and crossing Istanbul the violation siren rings. Although, we could not do nothing for that, because there was no office to ask. Approaching Istanbul the traffic increased and there was an endless traffic jam. We were almost immobilized on the Bosphorus Bridge, and in large sections before and after the bridge. We continued on the road to Ankara but approaching the city Bolu, we left from the highway and entered the old national road because it started getting dark. After Bolu, we found a narrow road to a small village called Burnuk and followed. Just before the village we turned left on the dirt road leading to the antennas hill above the village, where we found the flat grass of camping. Early in the morning, we depart to Ankara and continued to Aksaray. The road passes near Lake Tuz Gulu (Lake of Salt), a huge hypersaline lake with an area of 1665 square kilometers and salinity 32% while the depth of not more than 1,5 meters. The surface of the lake is at an altitude of 905 meters on the plateau of Anatolia. After we pass through Aksaray city (White Palace) and continue towards to the village Helvadere. 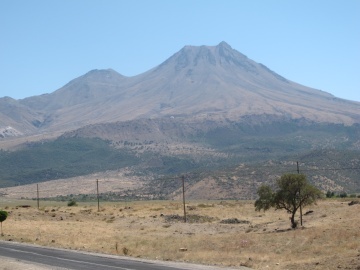 Helvadere village is located at the foot of the volcano Hasan (Hasan Dag Mountain). Hasan is one of the highest volcanoes of Turkey whose last eruption was estimated to 6200 BC. In the region of Anatolia there are many smaller volcanoes demonstrating great volcanic activity in the region in the past. In the afternoon we followed the road that leads up the mountain in an abandoned ski and hotel resort at an altitude of 1950 meters. The road to ski center was too steep, without asphalt and difficult to reach it. After having a good view from the mountain we decide from which route to climb it. After that we return back to Helvadere village which is a tourist resort area with lots of water and dew, where we eat in a restaurant. We stop in the mini market of the village for buying food and we realize that the front right wheel of the car has lost all the air. The mini market man does not speak English, although he helps us very much. He gives us an air pump and we refill the wheel with air and he suggests us to repair the wheel in a gas station (Sunpet) on the way to Aksaray. We drive far towards to Aksaray and we were luck the wheel did not lose the air. The man there was not speaks English but a group of cyclists pass and also help us to explain the problem and the man fix it. It was already dark and impossible to get back, up on the mountain to camp, so we asked to camp in the park behind the gas station and the owner accepted. Everyone helped us to the maximum to fix our problem that happened. At 5:00 in the morning was dark, when we left for the mountains (Hasan). We arrive in the abandoned ski center (1985m) at 6:20. Slowly but surely we started the climb at first very gentle slopes of the volcano. The slope gradually increased and the greenery is constantly dwindling. The terrain became rockier and there were big rocks scattered on the volcano slopes. There was no path to chose, such we choose the shortest way to the direct to the summit, although it was the steepest. Approaching the 2800 meters altitude, slope and the loose soil was such that the chute to the crater, with every two steps forward and we were a step behind. At an altitude of 3150 meters we reach the crater of the volcano and the opposite side of which is the highest peak of the mountain with an altitude of 3268 meters and the Turkish flag waving on the top. At the last part, the ascent requires easy scramble among huge rocks of the summit. The views are stunning with the vast plateau of Anatolia and rewards four hours of climbing there. To descent from the mountain is easier, but require attention because of flimsy and steep terrain. At 13:30 we arrive back in the ski center and took the road to the village and from there we drive direct to Demirkazik village, following small country roads. We found only on pension to stay (above the mini market) in the village center. After the last three days on the way (travelling and trekking) we stay for rest before starting the ascent to mountain Aladaglar. Demirkazik village has no restaurant, so we went to Camardi the nearest town 11 Km away for lunch. At the afternoon we spent with preparations for the climb to Aladaglar. We wanted to start early the approach the mountain, but we could not go out of the pension, because we were locked inside and we wait for the owner to unlock the door. With heavy backpacks (~ 20kg) which includes camping equipment, climbing gear, food, and water bottles departed from Demirkazik village 1600m altitude the trek to mountain Aladaglar, entering into the canyon Cimbar. The canyon is very impressive with towering vertical cliffs on its sides. In many places there are difficult passages. Also, it is very tiring to cross it due to high temperature, especially at noon. Going out of the canyon (~ 2200m) we were fatigue due to heavy backpacks and the heat and we constantly stop. Passing the small col in Tepekenari (2535m) fortunately we found the fountain and refueled with fresh water giving us courage to continue. Eventually, the path was very demanding and we arrived after a further three hours at the camp at 2860m near the sheepfold of the shepherd. Here was no drinkable water into the source. The water of the source had dried up three days earlier. This was a big disappointment. Then I borrow large bottles from the shepherd and trek further up the lake Dipsizgol, where shepherd gives water to his animals. Into the water of the lake live countless red ichthyosaurs (approximately 1cm). The lake was the only easy way to find water and so I brought 15 Kg at the camp. I drink enough water with red baby ichthyosaurs believing that water is drinkable, but unfortunately without any consequence. Nobody else drinks water from this lake, except the animals. Three good climbers from Istanbul returned to camp late at night, after a hard climbing on the northern slopes of the mountain's peaks. The three climbers helped us a lot by giving us lots of useful information on routes and mountain but mostly helped us to solve the problem with the water. Quite simply, suggested the shepherd to bring our drinking water from the spring in Tepekenari. So the son of the shepherd went to Tepekenari (3 km below) and brought us 50 Kg of water with mules, enough to drink and cook for many days in the camp. At noon I took the path to Demirkazik peak which is raising our impressive front and it was our first target. I climbed following the good path to the lake Adsiz Gol which, incidentally, those days had dried up. Then the trail disappears into the steep loosing slopes leading to climbing rocks with easy (I-II degree) in the col of the mountain on the east ridge. I reached up to 3150m, quite close to the col and I return back to camp. After this declaratory ascent I had a good idea about the difficulties of the path that we have to face the next day. At 4:30 we left the camp and walked in darkness for half an hour, reaching the point where I knew from the day before. Then the path was very difficult passing from a hard soil (ramp) that made the climb very dangerous because there was no point to belay. This section would be better to climb right over the rocks although it was steepest certainly was safer. The ramp ends at the east col at 3335 meters above sea level where we stopped a bit to rest before the final attempt. After the col the route begins to be more technically and climbs on the edge of the eastern ridge. Many continuous climbing steps several times on the edge of the ridge make the climb arduous and dangerous. Due to experience, we didn't use rope to secure in order to gain time. During the ascent identify the belays (pitons) and mark them to gps for rappel back. After four hours we reached the summit of Demirkazik at 3756m altitude, which is the highest peak of the mountain. All the sides of the peak are very steep and the route chosen was the classic (easier), but very demanding. Enjoying the view from above indemnify and relaxes to follow the way back. The descent is made with 6 large abseiling (rappels), however decided descent free with doing only two half-rope rappels, reducing the time to return. Eventually, after 7:30 hours of intense effort we got back to camp after a successful ascent. The next day John stayed in camp to rest, while I did a reconnaissance climb up the first steep cliffs summit Kucuk Demirkazik (Kucuk -> Small). Initially I followed the trail to the col between Demirkazik and Kucuk Demirkazik. From the col I traverse the steep slopes to Kucuk from the west side to the cliff summit. I climbed alone by self-securing the gully with change to chimney. From here I could not find the right route and I decided to return, although I reach altitude close to the summit. On the way back I spotted an easiest and shortest way to camp where I arrived before noon. Exploratory ascent proved very useful to attempt the next day, having been identified as the access route to the top and the climbing route near the summit. 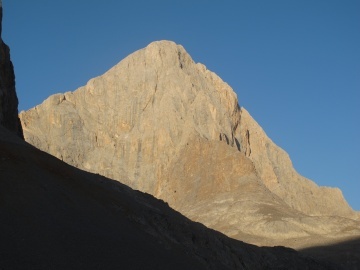 Early in the morning the two climbers set off for the final attempt to summit Kucuk Demirkazik. Crossing the western slopes of the peak with a few short passages they reached the base of the tower of the sub-summit. The classic route to the summit is about 120 meters of climbing IV degree of difficulty. Initially, the route followed by the chimney to a point becomes vertical (50 meters) and then comes back to the left where there is the belay. Then, descending nearly 10 meters lower, and then the route traverse left and climbs the plate that leads to a final groove for the sub-peak, but we did not found the correct route. An old sling misled us and led more left of the correct route, to a difficult gully where fortunately we found an old piton and we belay. From here climbing an upright portion (IV +), we reached the sub-peak and then the main summit of Kucuk Demirkazik 3425m. The position of the peak is in the west Aladaglar and has spectacular views to the villages Demirkazik and Camardi. While we remain on the summit we were worried about our return, first, because we had lost the right route and secondly, because we did not find the belay of descent (rappel - abseiling). The next and most important goal was the descent. By scanning the edge from the summit to the end of the sub-peak I found out the sling with the two pitons for where is doing the rappel. From there the edge ridge we descent carefully to belay and rappel down for 30 meters. Then, we descent for a few more meters into the gully and traversing north we found out the second rappel at the top of the chimney. The second rappel ultimately proved to be quite difficult because of its location. With third rappel arrived at the base of the route, where the return to the camp looked like a breeze after so many twists climbing preceding. Later that day I went alone for a second rapid ascent initially on summit Yildibasi but the choice of the route was incorrect and resulted in a stalemate in 3428 meters. 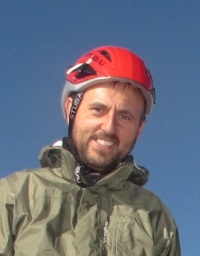 Then I climb the trekking peak Bozkaya II with altitude 3392m northwest of the camp. Early in the morning we left the camp and we took the path back to Demirkazik village. This time we chose an easier way which passes from the plateau Arpalik and descend the gentle slopes to the village without crossing the difficult canyon (Cimbar). The trail is clearly and visible, while at Aprlaik location there is spring and a dirty road in good condition reaches from the village. We follow the road for a while and then turned right on the path that leads straight to the village. We went direct to the sports center and camped with 15 TL per tent. Many athletes from the national youth team kick boxing of Turkey were there for training. In the morning we left the village Demirkazik and traveled to Cappadocia which is relatively close. We bought a single input card for most historical sites and we started from the underground city Derikoyu then the underground city of Kaymakli there arrived in Goreme, first passing from the castle of Uchisar. In Goreme we found hotel with 110 TL a night where we stayed for one night. In the afternoon we walked to the Goreme Open Air Museum and made many walks and had dinner in the village. Early in the morning we left from Goreme and we went to the adjoining valley of Zelve with beautiful chimneys. We visited the ancient city of Zelve with the ancient churches carved into the rocks in a town very well organized by dozens of centuries past. Before noon we visited Prokopi (Urgup) and we stay for a coffee and lunch. On the way to Kayseri we visit another underground city in Ozkonak. 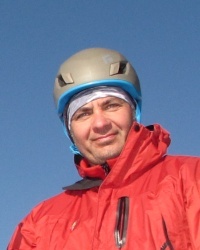 At the afternoon we arrived to Kayseri where a very good friend and climber Nurettin waits for us. Nurettin and his wife Agi hosted at home of Nurettin's mother and we had a very good afternoon to night. It was a great pleasure to meet each other. The way back was long and we left at 8:00 in the morning from Kayseri in order to get as close as possible to Greece. This time to avoid the big highway and the traffic jams in the Istanbul, we follow the road from Ankara to Eskisehir and from there to Bursa, passing first from Moudania. After Bursa was already too late and camped at a gas station we met on our way near the lakes and had many mosquitoes. At the morning we continue to harbor of Lapeski, where a ferry boat we went to Gallipoli passing the Dardanelles. A few kilometers left to the border so we decided to go through the Kesan to have a look of the city. Actually, Kesan was very ugly and had no interest. Soon we passed Evros river and entered into Greek territory. At noon we arrived in Xanthi where I stayed while John continues driving to Larisa where he arrived in the afternoon. After completing two weeks in Turkish mountains both climbers will surely keep the memory of the great development and infrastructure (at least with regard to roads and reconstruction) of the neighboring country, but especially the hospitality and assistance of the Turks. We will not forget cliff peaks of Aladaglar. We hope soon to return to Aladaglar and attempt some more peaks and trails.